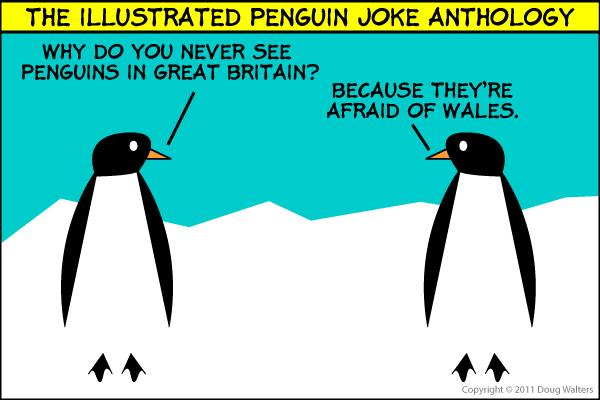 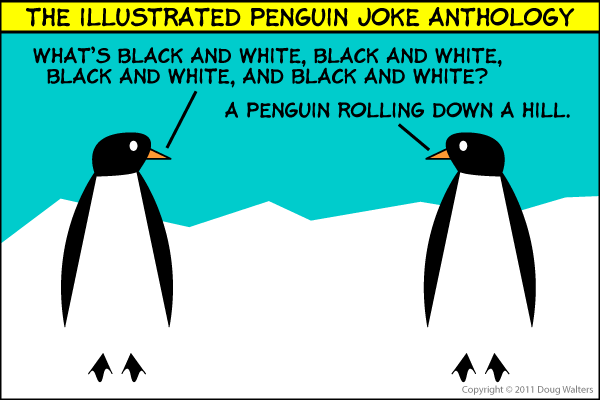 Jokes About Penguins. Jokes Told By Penguins. Illustrated. The Penguin Joke: British Nuclear Scientist Penguins Q: What do British Nuclear Scientist Penguins eat?A: Fission Chips. The Penguin Joke: Indecisive Q: How does an indecisive Penguin make a decision?A: Flipper coin. The Penguin Joke: Flying Q: Why can’t Penguins fly?A: Because they can’t afford the plane tickets. The Penguin Joke: Marshmallows Q: Why do Penguins sit on Marshmallows?A: To keep from falling into the Hot Chocolate. The Penguin Joke: Stealing an Octopus Q: What do you call a Penguin who steals an Octopus?A: Squidnapper.